Today I went to Woodland View. The match was held on Arles pool. This is my first visit to the venue so didn't know where you wanted to draw. 29 of us all round Arles was always going to be a hard match. We all lined up waiting to take our draw. Peg 22 stuck to my hand. Didn't know where this was so had a quick walk round to have a look at my peg. It's on the end of the island and towards the corner of the lake. But 21 was in so he had the long edge line. 13m of my Colmic Airon F44. 0.15 Spider line and 0.13 hook length. To a Jon Walker .4 float. With the Yellow colmic elastic. Where I'd feed hard pellets. Top 5. Same line and float and the same elastic. It was around 4ft deep here and maybe 5ft at 13m. I did set up a half depth rig just in case I felt the fish were coming up off the deck slightly. This was a Colmic Mike float. 0.15 mainline to 0.13 spider. To an 18 B911. Next Adventure 45 rod. Set up on a little pellet feeder for chucking to the island. I fed my short line and long line on the whistle and chucked the pellet feeder against the island. It mustn't of been in much more than 2 minutes after the tip dropped back. Just the start I needed! Played the fish really carefully as it's nice to get off to a good start. 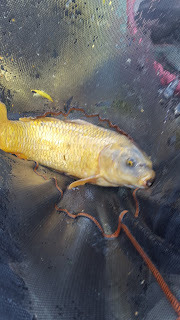 Got it under the rod tip and it felt quite big. 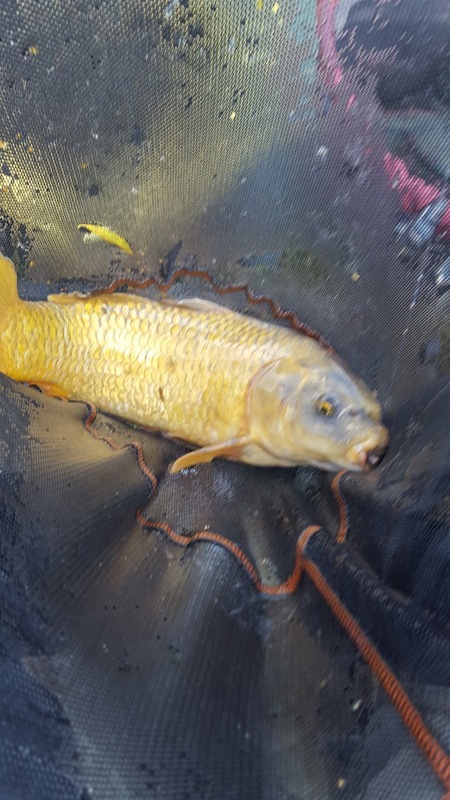 I managed to get his head up and it was a big mirror about 8lb which I could see hooked in the top lip..... next minute. You guessed it. Hook pull! Not what I needed! Decided to go back on this, but didn't have any indications. Looking round the lake no one was really catching but a few fish had been caught on the pole. So I shipped out my long rig and began catching a few. I started off cad potting in some dampened 4mm pellets and fished a hard 6mm on the hook. I probably caught 3 fish in a short amount of time. But they soon faded. By now we were probably an hour and a half in so decided to have a look on my short line where I'd been throwing a few pellets. Had another small carp on this but it was very clear that you seemed to catch a fish on one line then you would have to do something else. By now I had around 20lb ish which was doing ok.
From about 12:30 - 2:00 I couldn't get a bit anywhere! Everyone was struggled and the lake just seemed to switch off. But I didn't do anything stupid and kept feeding a bit of bait. I put my plummet on and plumbed up a new line at 14.5m. This proved to be really good. I caught steadily on this. Mainly F1s and a couple of carp. With 20 minutes to go my long line seemed to die so I dropped in on my short line and had another 3 f1s. 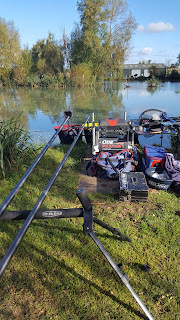 My mixture of carp and F1s weighed 54lb which was enough to win the match! Really enjoyed it. As funny as it sounds, I like fishing negative and thinking about where I'm gonna get my next bite.